Royal Caribbean cruise ships offer a lot to see and do but for many guests, it is all about spending (a lot of) time at the pool. Royal Caribbean designed their pools to be fun, relaxing and most of all refreshing experiences. Whether you are there for the ambiance, the cooling effect or the activities, time at the pool is a great idea. Depending on which Royal Caribbean ship you sail on, the pools available to you will differ but there are some basics that are universal across the fleet. Royal Caribbean ships generally have multiple pools per ship, with different audiences intended for each pool. The main pool is the general purpose pool that is open to everyone. It is usually located in the center of the ship's pool deck and open for swimming throughout the day and into the evening. The main pool is also where you will find various events, such as the belly flop competition or crew vs. guests pool games. Available on Oasis, Freedom and Voyager class ships to the Caribbean, Royal Caribbean offers scuba classes. Participants must be at least 12 years old. Weather permitting, the main pool is also home to the fun celebration that is sail away, where guests and crew get together to sing and dance and celebrate the beginning of the cruise vacation. On certain larger ships, there are multiple main pools. 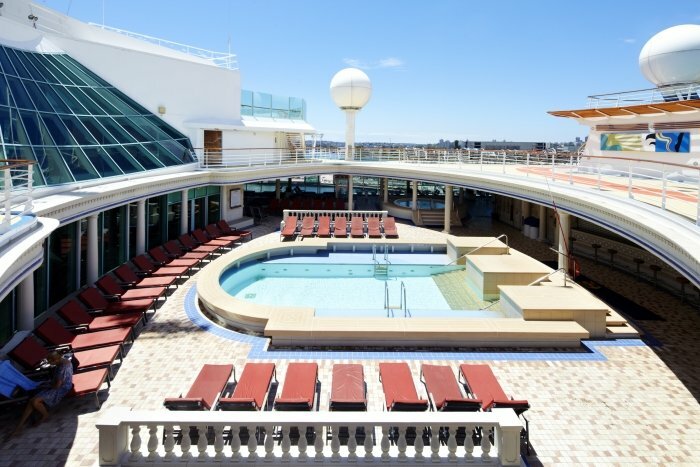 The Quantum class ships have an indoor and outdoor main pool. The Oasis class ships offer multiple outdoor pools. The only restrictions for guests in the main pool is children who are not 100% potty trained and/or wearing diapers may not swim in the main pool. The Solarium is the adults-only pool that is open to guests that are at least 16 years old. It is usually located in the front of the ship's pool deck and is often indoors or with a retractable roof. Because of the indoor nature of the Solarium, it tends to be warmer and more humd in the Solarium than the main pool. Royal Caribbean also tends to have cushioned lounge chairs that differ than the loungers available in the main pool. During inclement weather and select hours, the ship may permit the Solarium pool to be used by guests under age 16 provided they are directly supervised by a parent or guardian. Since the Solarium is located in the front of the ship, there are some great views available of the ocean and sky that are great for watching as the ship sails. 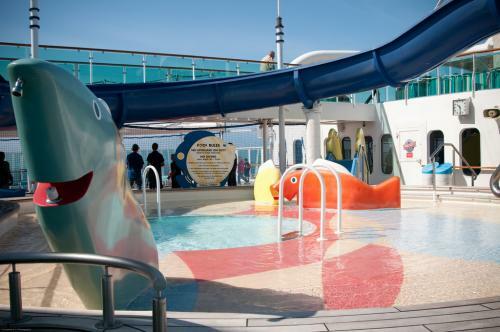 Royal Caribbean offers on some ships pools and water play areas specifically for children. On the Freedom, Oasis and Quantum class ships, there is an H2O Zone and on the Radiance class there is a kids pool and water slide. Enchantment of the Seas offers a splash deck, which has 64 water jets, 40 of which are connectd to an interactive touch-pad system so kids can direct the water to splash each other. The kids pool areas are built specifically for kids that are 100% potty trained with lots of splashing, spraying and fun available. For children who are not potty trained, some Royal Caribbean ships offer baby pools that are specifically built for these children. These dedicated baby pools are ankle deep on a baby and a few feet across in dimension. Royal Caribbean's pools are open as much as possible during your cruise. The pools will be closed occasionally when they need to be cleaned as well if weather or sea conditions make the pools unsafe for swimming. Royal Caribbean tries to keep at least one pool open at any given time. Nearly all the events happening at a pool will occur at the main pool. Royal Caribbean is a huge proponent of live music and you can often enjoy bands playing music at the main pool throughout the day. These bands will play reggae, classic rock and even contemporary hits. For fans of live music, sitting by the pool and enjoying music is perfect. A very common question is how easy/difficult is it to get a chair at the pool throughout the day. Like so many things in life, the answer is, "it depends". In general, on sea days, the pools tend to be the most crowded. When the weather is warm and sun is out, many guests want to spend time at the pool swimming, relaxing, napping or just enjoying being outside. Royal Caribbean provides a lot of chairs and lounge chairs all over the pool decks. You will find an additional deck of pool chairs and lounge chairs on the deck above the pools for those looking for sun or to just get away from the pool traffic. Will most, if not all, of the chairs get taken by some point in the day? There is a good chance of that happening. Royal Caribbean does encourage guests to not reserve chairs for an entire day. On some ships, the crew will actively free up unoccupied chairs to open them up for other guests. In general, you will have much better luck finding an open lounge chair on the upper deck, away from the pool or in areas without a view of the pool during peak times. If you want a view of the ocean, it is usually easier to get a chair. The pools are less crowded on port days, during dining hours (especially dinner) and on embarkation day. Complimentary pool towels are provided for guests near the main pool. Royal Caribbean discontinued the policy of needing a SeaPass to reserve them. If you want that perfect pool-side chair, plan to arrive early. Usually before 11am. Suite guests have a special reserved section of chairs just for them. Their location and availability depend on the ship. In our experience, night time is the least crowded time at the pool. What do you love about Royal Caribbean's pools? Share your experiences in the comments!